Inatime: Another Time - When is a Romanesque S not a Romanesque S? Another Time - When is a Romanesque S not a Romanesque S? When it's a Hamilton "Trent". Like my box o' chocolate post, this one is about a watch not being what it seemed. Like many of my watch projects, I pick them up on eBay. 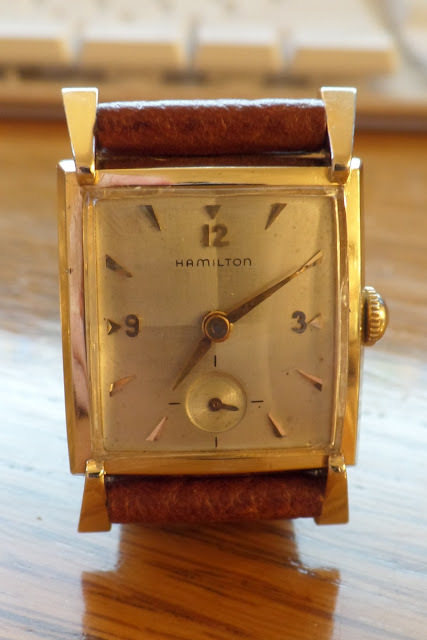 This past month I picked up what I thought was a c. 1960 Hamilton "Romanesque S". I'm really not sure about these model names, but that discussion will have to be saved for another post. With an eBay description like "SUPERB 1960 Hamilton 22J Adjusted Gents ROMANESQUE S Art Deco RUNS! L@@K!! N/R" wouldn't you want to buy it? I've bolded and capped the words the way they were in the eBay listing. I obviously didn't pay much attention to the listing as I was probably caught up on what I thought was an incredible bid price for this model. The catalog page above clearly shows the difference between the Romanesque S and Trent - the dials (i.e. watch face) and markers. The Romanesque S dial has a textured dial (the "Romanesque" finish). The catalog picture of the Trent does not properly highlight the four-quadrant bevelled dial. This bevel plays with light and depending on how light hits it, looks darker and lighter in each of the quadrants. The Romanesque S has black numerals and markers while my Trent above obviously has gold. You can see in the shot of my Trent above how the light hitting it at the angle in the picture that there are four distinct quadrants. In addition to the watch case similarities between the two models, they both came with a 22 jewelled movement although the Trent also had a 17 jewel movement available (likely older model years during its long production time). The Romanesque was only produced for a single year in 1960 while the Trent was produced from 1955 to 1969. I suppose if I had indeed bought a Romanesque it would have been somewhat rarer than the Trent. 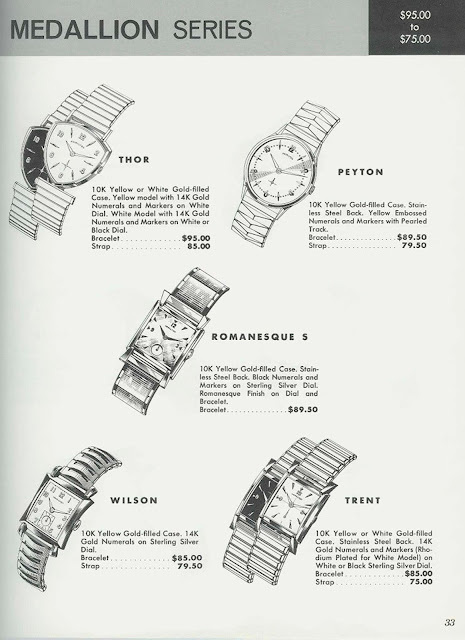 Some research on Vintage Watch Forums and from the newly released book "Hamilton Wristwatches, A Reference Guide" by Bruce Shawkey, I was able to determine that my Romanesque S was rather a Trent and indeed from Another Time. If you are interested, Bruce's book can be obtained by following this link: Bruce's Website.